Korea's Park Sung-hyun has captured her second career LPGA major title in a playoff, punctuating an impressive final-round comeback that featured an outstanding recovery shot late in regulation play. 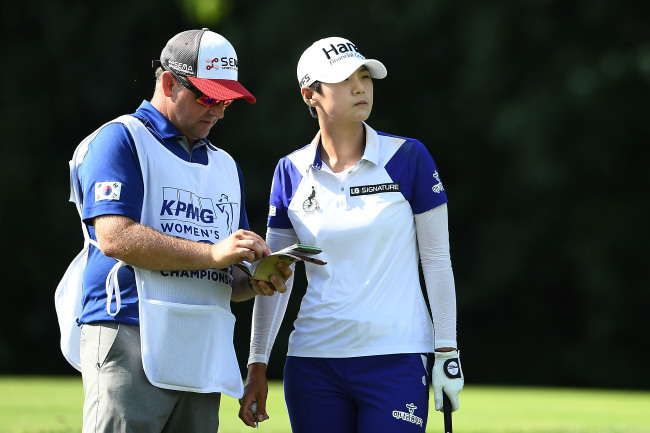 Park defeated fellow Korean Ryu So-yeon and Japanese teenager Nasa Hataoka in a playoff to claim the weather-interrupted KPMG Women's PGA Championship at Kemper Lakes Golf Course in Kildeer, Illinois, on Sunday (local time). After Hataoka was eliminated in the first playoff hole, Park beat Ryu with a birdie on the second playoff hole to take home $547,500. Park's previous major victory came at the US Women's Open in 2017, a historic season in which she also grabbed the Rookie of the Year award and the money title while sharing the Player of the Year honors with Ryu. Park, who shot a bogey-free 69 in the final round to force the playoff, said her dramatic day felt "like a dream." "Everything went so well today," Park said in a televised interview before her victory ceremony. "It's such a gratifying day." The 24-year-old said she drew upon her experience of winning last year's US Women's Open and added, "Late in the round today, I kept thinking about what I did to win the US Women's Open last year. And I was able to stay relaxed down the stretch." Park, world No. 6 who now has four LPGA wins, got off to a sluggish start to 2018 before winning the Volunteers of America LPGA Texas Classic on May 6. With this major title, Park's early season woes -- which saw her miss two cuts in seven starts with one top-10, after not missing any in 23 events last year -- are well behind her. Park is one of five Koreans to win on the tour this year, and she is the first from the contingent to grab multiple titles in 2018. All three LPGA major champions this year have been determined in playoffs. Park, Ryu and Hataoka all ended the 72 holes at 10-under 278, though they each took a vastly different route to get there. Ryu was the overnight leader at 11-under but committed two double bogeys for a 73 in the final round, while blowing a two-shot lead with two holes to play to fall into the playoff. Park's 69 included a string of nine straight pars at one point. Hataoka, who was tied for 23rd heading into the final round at two-under, fired a 64, the best score of the day, while picking up two eagles. Park was four behind Ryu at the start of the day at seven-under. The two Koreans and Canadian Brooke Henderson, who was sitting at eight-under, were placed in the final group, and they were forced to get an early start at 9:31 a.m. (local time), due to threatening weather. Henderson shot herself out of contention with three bogeys over the first six holes, but Park erased her four-shot deficit on Ryu in the first four holes. Ryu committed a double bogey at the second hole, and Park pulled even at nine-under with back-to-back birdies at the third and fourth holes. But Ryu bounced back with consecutive birdies of her own at the sixth and seventh, which took her back to 11-under, two up on Park. Playing in eight groups ahead of the two South Koreans, Hataoka was making a run to the top. The Japanese teenager, who won her first LPGA title the previous week in Arkansas, took the clubhouse lead at 10-under after a 64. Ryu took a three-shot lead on Park with a birdie at the 11th but gave back a shot two holes later. And there was to be plenty of drama over the final three holes. At the par-4 16th, Park put her tee shot perilously close to the water hazard and nearly dunked her second shot into the water as well, with the ball caught in some deep fescue. With Ryu lying on the green, it seemed Park would be fortunate to get away with a bogey. But Park chopped the ball out of the tall grass and landed it softly to within a few feet of the hole. After watching the play unfold, Ryu calmly drained her lengthy birdie putt to reach 12-under par. Park made her par putt to stay at 10-under but now Ryu was up by two shots with two holes to play. But that lead disappeared on the very next hole, the par-3 17th, where Ryu found water off the tee. Park nearly took a one-shot lead at the 17th, but her long birdie attempt lipped out. That left Ryu and Park tied at 10-under heading into the final hole, with Hataoka, who'd finished her final round more than an hour earlier, also sitting at 10-under. par-4 18th, but both narrowly missed the attempt that would have sealed the title. Ryu, Park and Hataoka went back to the 18th for the first playoff hole. Ryu was the farthest from the pin, after her second shot landed on the fringe behind the pin, but she drained the birdie attempt and put pressure on the other two. Hataoka rolled her putt way right and was eliminated from contention. Park, needing to make hers to stay alive, drained the putt to take the playoff to the 16th, the site of her adventures in regulation. Both players landed their second shots on the green, when the play was halted due to a threat of thunderstorms.